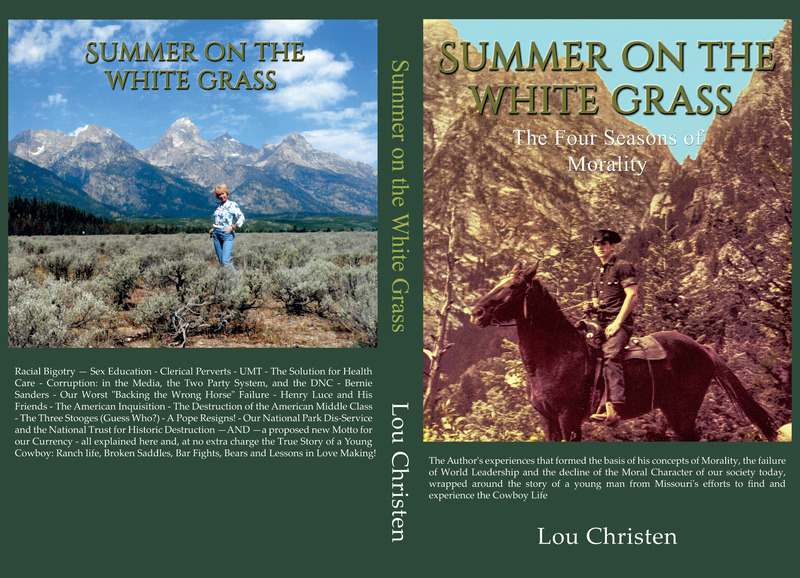 (for friends of Lou Christen or Jane Butel, or friends of the White Grass), signed copies of “Summer” are offered at $30.00 (hardbound) and $15.00 (softbound), Postage paid. 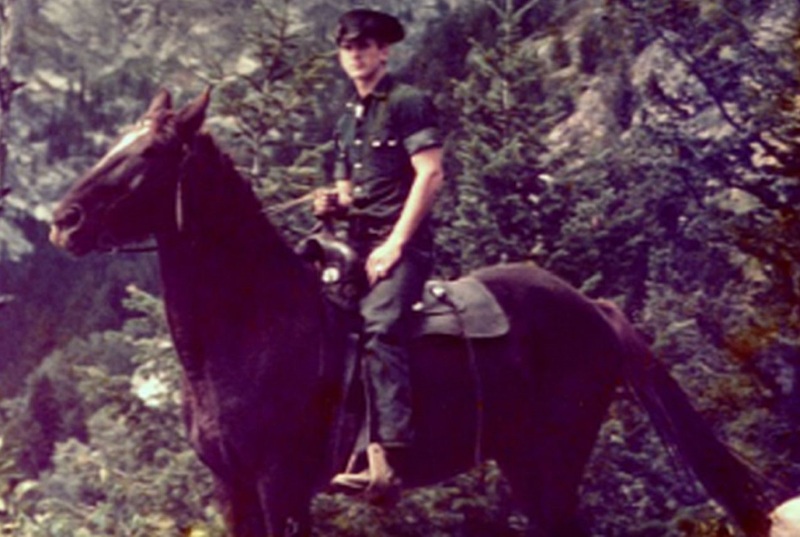 Send check made payable to Lou Christen, White Grass Restoration Fund, 138 Armijo Court, Corrales, NM 87048. Please allow about one week for USPS delivery, guaranteed, and track-able. The ‘friends’ in the first line Implies absolutely no reference to ‘Facebook’–which the author detests. Don’t forget to put who the book is to be inscribed to on your check. Thanks! 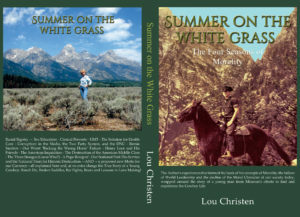 The Author has re-written “Summer on the White Grass” as a ‘stand alone’ story of the White Grass Ranch with the proposed title of “What Happened to the White Grass Ranch—” and is considering publishing it as a testament to the chicanery of the National Park Service and the National Trust for Historic Preservation. He is also writing a full book length ‘Memoir’ of his life, including United States manufacturing business ownership and International trade experiences, in ‘Short Story’ form and, in that process, detailing the ‘HOW and WHY’ the United States lost its position as the world’s number one industrial economy, the death of our middle class, the rise of the ‘One-Percent-ers’, the great income disparity in our society, the real reason for the election of Donald J. Trump and the total failure of ‘Leadership’ by our government. Some of the ‘Short Stories’ have been or will be submitted to publications such as ‘The New Yorker’ Magazine. Thirty-eight stories are finished (but not yet edited) and, maybe, another forty-two, or more, to go! And, he has started on what would be his fourth book tentatively titled “The Lost Compass” in which he and his co-author Grand-Daughter , Louisa Christen (now at Georgetown University), will do their best to prove that ‘Morality determines the condition of a society’ and the loss of it could cause it’s collapse. A sub title could be, “How the election of Donald J. Trump, or the possible election of Hillary Clinton, could be (or have could been) the harbinger of ‘bad things to come’ for the United States of America.” More important than just showing were we are and how we got there (in our society), the Authors plan to present their plan or plans (quantity to be determined during the writing process) for a political structure and the methodology to put it in place to build a sound, fair and just society for all Americans, the ‘One and Zero Percent’ers’ included. Not an easy task!. The Author has been invited to participate (and accepted) in the Albuquerque Museum Authors’ Festival to be held at the Museum on Nov 2nd & 3rd of 2018. More, on that event, later! That should be enough to keep me ‘off the streets and out of the bars’ until Christmas, at least!